We know you have many options when shopping for door hardware which is why we strive to offer the best service in the industry. 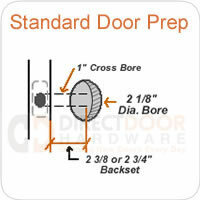 Unlike many competing door hardware retailers online, this is our full time job. We've been in business for over 10 years and when you contact us, we'll actually answer phone calls and respond to emails. We'd love to help you with your next project. Give us a call for whatever help you may need, including price matching or finding products you aren't able to find online. Call us today - 307-886-9449.